Brothers and sister, they grew up and learned together music, the Trio Metral members share a connection and a sensibility wrought over years of scene experiences, travels and beneficials encounter. Their already large repertory grow rapidly thanks for a common interest for all music style. And lead them to work with numerous master of classic music as well as famous contemporary composer. 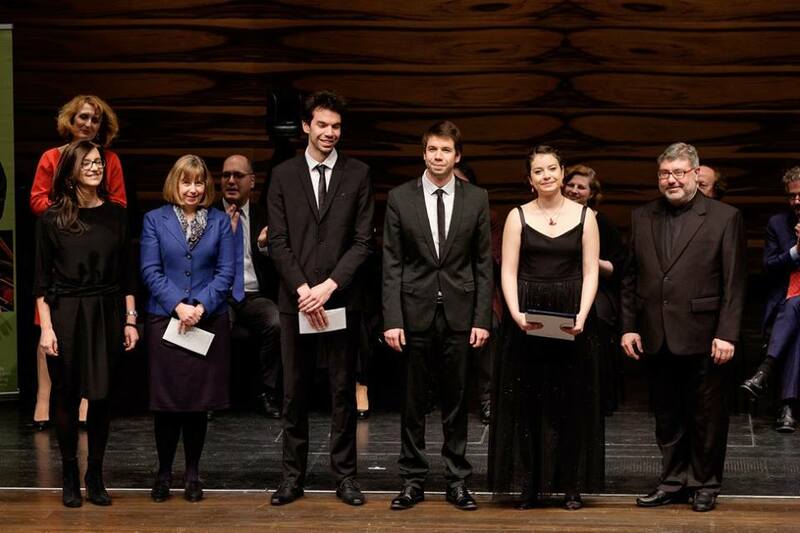 Together and individually they are prizewinner of more than fifteen Prize; recently they have won the First Prize with Two Special Prize at the international Joseph Haydn competition in Vienna. The Trio Metral is in residence at the Queen Elisabeth Music Chapel where they work alongside illustrious formations including the Artemis Quartet. They also benefit from Michel Dalberto's attentive and caring advice, which they followed at the Paris Conservatory. By Tal Agam. Link here. Beethoven's triple concerto at the Philharmonie 2 in Paris. Thanks to the OLC Orchestra, Philippe Aiche, David Petrlik, Takuya Otaki, and of course the audience so enthusiastic for this unforgettable concert! "The Trio Metral, composed of three brothers and sister, places at the beginning of the program the dark Andante of Grieg, the only remaining movement of a trio never completed, before a score of the young Sibelius, and the magnificent second Mendelssohn Trio, a pure masterpiece carried away with exaltation by a trio clearly destined to become one of the great ensembles formed." The Trio Metral wins the 1st Prize at the international competition of Piano Trio J. HAYDN 2017! With 2 Special Prize! The Audience Prize, and the best performance for the J.Haydn piano trio! The Trio Metral integrated Fondation Singer-Polignac Residency. Le Trio Metral is laureate of the Banque Populaire Fondation. The Trio Metral integrated the Proquartet Residency Artist, joining Quartet Arod and Van Kujik actualy in residence. The Trio Metral integrated the Queen Elisabeth Music Chapel Residency Artist, joining Trio Zadig and Trio Medici actualy in residence. "Génération jeunes interprètes" Gaëlle Le Gallic show is diffused on France Musique. To see again our Mendelssohn trio look at our Youtube channel!